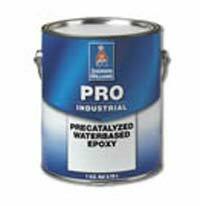 The Pro Industrial Precatalyzed Waterbased Epoxy is a single-component, commercial-grade water-based epoxy. The epoxy is designed to endure washings and chemicals and delivers a long-lasting finish with the look of traditional latex. In addition, the number of coats needed is minimized due to its hide and coverage characteristics. It does not need to be mixed or measured and has no limited pot life. The epoxy is available in egg-shell and semi-gloss.